Admittedly, we are not the pioneers of bullet journaling. The concept was created and took off back in 2014 by digital production designer, Ryder Carroll. Though it has taken us three years to hop on the trend, we certainly can’t be the only ones living under a rock. Therefore, for those of you still struggling to wrap your head around the mystifying concept of “bullet journaling,” we have done our research and are here to share our findings. The bullet journal (or BuJo as some people have coined it) is essentially a blank notebook that you organize and fill with lists and bullet points (hence the name). A plain journal is used to create a yearly, monthly, weekly, or daily planner. However, what makes the journal unique from store bought planners is that the blank pages allow you to organize your planner to your liking, and also provide a canvas for you to add to-do lists, lifestyle planners, doodles, inspirational quotes, and much more! If you’re like us, you’re probably juggling multiple notebooks at once. Rather than tote around three separate books for your planner, diary, and sketchbook, why not combine them into one organized entity? Bullet journals allow you to keep everything all in one place, minimizing chaos from your life while also being a fun and creative outlet. If nothing else, a bullet journal is necessary because it is the perfect excuse to go crazy purchasing a plethora of beautiful notebooks, pens, markers, washi tapes, and stickers. Pick a journal. Ruled, grid, or blank pages – whatever your preference, get yourself a journal to get started. 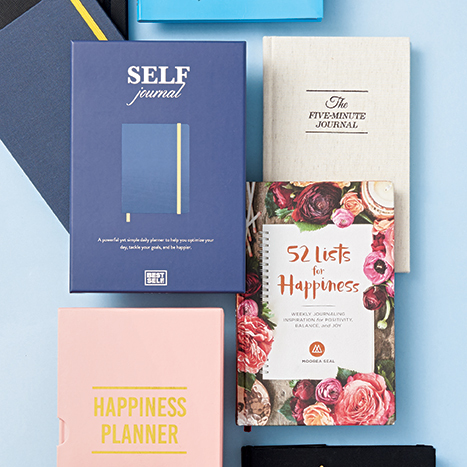 Paper Source offers personalized journals in a variety of styles and sizes on our site, along with a wide selection of ready-to-go notebooks online and in stores! Grab some pens, markers, stickers, and washi tape to decorate and beautify your journal. Start with an index. This will be used to indicate what page each section is on, making your journal easy to navigate. Make a future log. There are multiple ways to do this. One way is to divide an open page into six portions and label each portion for the next six months. Remember to number the pages and put them in your index. Make a monthly log. Carroll suggests using the left page of the journal to write a list of each day of the month, and the right page to be used as a monthly task list (what you want to accomplish within the month). Number these pages and add them to your index. Make a weekly/daily log. Each open journal page can include one week’s worth of days, much like a weekly planner. Divide the page into seven sections and label each section with the day and date. Keep the weekly planner going as each week approaches, and add the pages to your index. At the end of a month, make a new monthly log and record the pages in your index. Scan through the tasks from the daily logs of the previous month and: x out tasks you have completed, cross off tasks that were not done but are no longer necessary, add a right arrow to tasks that you need to carry over to the next month, and add a left arrow to tasks that take a longer amount of time and can be added to your future log. Include other pages wherever you find necessary. One example is a “collections” page that includes related notes or tasks like shopping lists and quick memos. You can also add habit trackers for each month. For this, list the days of the month across the page, and then make a vertical list of habits you want to keep accountable for (ex: working out, eating healthy, reading every day), and place an “x” whenever you do that habit each day. Other ideas include mood trackers, expense trackers, New Year’s resolutions, and lists of books to read or films to watch. No pressure! We have plenty of beautiful planners and books that provide you with an easy to use template to start your organizing, but can still be customized and doodled in for some fun customization. 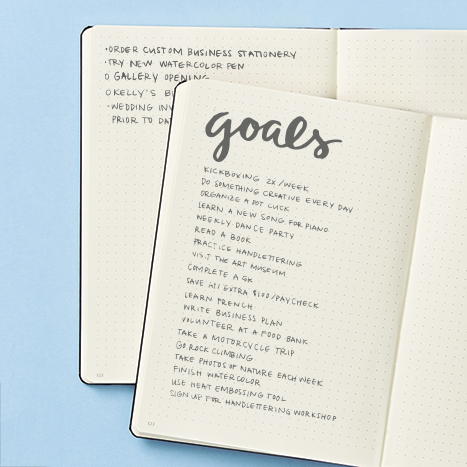 Check out the Productivity Planner, and our new collection of planners here! Check with your local store later this month for more information on an exciting workshop to help you get started on your creative journaling journey! This should be one of the classes that you offer! My girlfriends and I would DEFINITELY participate in this one. We always love the card making classes. You’re in luck! Select stores will be hosting a bullet journaling class in the coming months – check with your local store to see if they will be hosting or ask about how you can throw an exclusive party workshop with your friends! I’d recommend reaching out to your local store to see when they will be hosting a Creative Journaling class. You can find a list of our locations here. Where is the next bullet journaling workshop being offered near zip code 10583? Hi Aimee! It appears we have quite a few locations near that zip code, which can be found here. I’d recommend calling your local store to see when they may be hosting this workshop next! Nothing near DC? type A central…. Hi Renee! I’d suggest reaching out to your local store to see when they may be running this workshop – a lot of your local store’s classes aren’t listed on our site. Do I need to call the individual store for a list of upcoming classes? I would love to take a Bullet Journaling class. Any thoughts of opening a store in Fredericksburg, Va? On another note, I used to get regular email from Paper Source listing their promotions and classes. My computer had a glitch and I lost some of my favorites. I no longer get any emails from Paper Source, but I would love to still get them. I went to one of your stores last month and a sales representative put me back on your list, but I still have not received an email from Paper Source. Can this be remedied? I am from Rochester MN and since my car is not safe my husband will have to drive me if he is able. I need to know the date of your bullit journal class so I can check his schedule. Hi Tammie! The workshop date will vary by location, so I recommend reaching out to your store directly. You can find a list of Minnesota stores here! May I suggest calling a local store? Most stores will put together a class if there is enough interest. For example, the Studio City, Calif., store, which ran the Creative Journaling workshop last month, is taking sign-ups to run the class again. I really enjoy my Bullet Journal. The flexibility to set it up the way that makes sense to me, using collections, and having space to doodle and add color are so helpful (and fun). I’ve adapted it over several years to fine tune it to my needs. It was great to have full permission to take the ideas that work for me and do my journal that way.